Next Tuesday, February 26th, a special placeholder election will be held for New York City Public Advocate. The winner will replace Letitia James, who vacated the office after being elected State Attorney General, until a full term election, including primaries, can be held later this year. 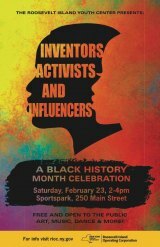 Inventors, Activists and Influencers: A Black History Month Celebration! 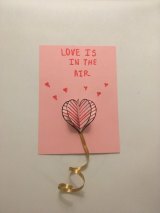 Since the Carter Burden Network's arrival at the Senior Center, 546 Main Street, art class conducted by John Mendelsohn spurred enthusiasm among evolving artists. 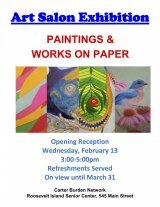 Their recent paintings and works on paper, products of his classes, go on view February 13th, in a salon exhibit. An opening reception with refreshments will run from 3:00 to 5:00. Everyone's invited. 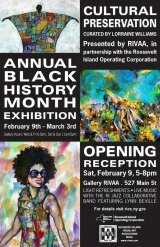 After a months long closure for structural repairs, the Roosevelt Island Visual Art Association, in partnership with RIOC, kicks off Black History Month with a free, public opening reception for Cultural Preservation on Saturday, February 9th, from 5:00 to 8:00 p.m. You're all invited. Osteoarthritis is one of the most common physical ailments. It's incurable and eventually affects virtually all of us. 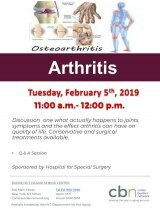 Learn about osteoarthritis and treatments available in a talk at the CBN/RI Senior Center, 546 Main Street, sponsored by the Hospital for Special Surgery, beginning at 11:00 a.m. of February 5th. With tax season in full swing, the Carter Burden Network has made arrangements with AARP Tax-Aide to bring free tax preparation services to the Senior Center for low to moderate income taxpayers at the Roosevelt Island Senior Center, beginning in February. 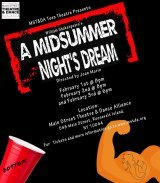 Premiering on February 1st is Main Street Theatre & Dance Alliance's Midsummer Night's Dream, a teen theatre deep dive into Shakespeare, classical fantasy and fun with love and imagination. Additional shows follow on the 2nd & 3rd. Details below. Do you or someone you know have a hearing loss? 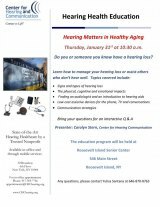 On January 31st at the CBN/RI Senior Center, learn to manage your hearing loss and help others who don't hear well. 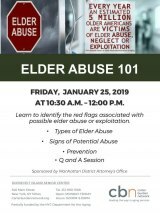 The educational program begins at 10:30 a.m.
On January 25th at 10:30, the Manhattan District Attorney's office invites you to learn to "identify the red flags associated with possible elder abuse or exploitation."